SEOUL, South Korea (AP) — North Korea said Monday the missile it launched over the weekend was a new type of “medium long-range” ballistic rocket that can carry a heavy nuclear warhead. A jubilant leader Kim Jong Un promised more nuclear and missile tests and warned that North Korean weapons could strike the U.S. mainland and Pacific holdings. North Korean propaganda must be considered with wariness — Pyongyang has threatened for decades to reduce Seoul to a “sea of fire,” for instance — but Monday’s claim, if confirmed, would mark another big advance toward the North’s goal of fielding a nuclear-tipped missile capable of reaching the U.S. mainland. Some experts, including officials in Tokyo, estimate that Sunday’s launch successfully tested a new type of missile in Pyongyang’s arsenal. The test is also an immediate challenge to South Korea’s new leader, Moon Jae-in, a liberal elected last week who expressed a desire to reach out to North Korea. Pyongyang’s aggressive push to boost its weapons program also makes it one of the Trump administration’s most urgent foreign policy worries, though Washington has struggled to settle on a policy. North Korea’s official Korean Central News Agency called the missile a “new ground-to-ground medium long-range strategic ballistic rocket,” and said the “Hwasong-12″ was “capable of carrying a large, heavy nuclear warhead.” Kim Jong Un witnessed the test and “hugged officials in the field of rocket research, saying that they worked hard to achieve a great thing,” according to KCNA. South Korea’s Defense Ministry said more analysis is needed to verify the North’s claim on the rocket’s technological features. Spokesman Moon Sang Gyun said it’s still unlikely that North Korea has re-entry technology, which would return a warhead safely back into the atmosphere. Japanese officials said Sunday the missile flew for half an hour and reached an unusually high altitude before landing in the Sea of Japan. 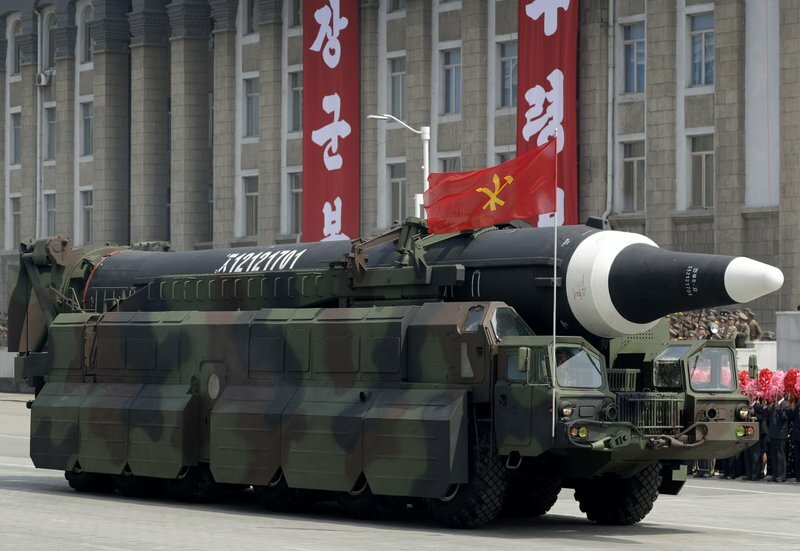 North Korea is not thought to be able yet to make a nuclear warhead small enough to mount on a long-range missile, though some outside analysts think they can arm shorter range missiles with warheads; each new nuclear and longer-range missile test is part of the North’s attempt to build a nuclear-tipped long-range missile. The launch complicates the new South Korean president’s plan to talk to the North, and came as U.S., Japanese and European navies gather for joint war games in the Pacific. Moon, South Korea’s first liberal leader in nearly a decade, said as he took his oath of office last week that he’d be willing to visit the North if the circumstances were right. The U.N. Security Council will hold closed consultations about the launch on Tuesday afternoon, according to the U.N. Mission for Uruguay, which holds the council presidency this month. U.S. Ambassador Nikki Haley said on ABC television that the United States has been working well with China, Pyongyang’s closest ally, and she raised the possibility of new sanctions against North Korea, including on oil imports. The Security Council has adopted six increasingly tougher sanctions resolutions against North Korea. President Donald Trump’s administration has called North Korean ballistic and nuclear efforts unacceptable, but it has swung between threats of military action and offers to talk as it formulates a policy. While Trump has said he’d be “honored” to talk with leader Kim Jong Un under favorable conditions, Haley seemed to rule out the possibility. “Having a missile test is not the way to sit down with the president, because he’s absolutely not going to do it,” she told ABC. The U.S. Pacific Command said the flight of Sunday’s test “is not consistent with an intercontinental ballistic missile,” a technology the North is believed to have tested clandestinely by launching rockets to put satellites in orbit. David Wright, co-director of the Global Security Program at the Union of Concerned Scientists, said the missile could have a range of 4,500 kilometers (about 2,800 miles) if flown on a standard, instead of a lofted, trajectory — considerably longer than Pyongyang’s current missiles. He said Sunday’s launch — the seventh such firing by North Korea this year — may have been of a new mobile, two-stage liquid-fueled missile North Korea displayed in a huge April 15 military parade. Japanese Prime Minister Shinzo Abe told reporters that the launch was “absolutely unacceptable” and that Japan would respond resolutely. Italian Premier Paolo Gentiloni said the G-7 summit his country is hosting later this month would discuss how to deal with the risk North Korea’s missile launchings pose to global security. “It’s a serious problem for global stability and security, and I’m convinced that the upcoming G-7, in friendship, will contribute to resolving this issue,” he said in Beijing. The launch came as troops from the U.S., Japan and two European nations gather near Guam for drills that are partly a message to North Korea. The USS Carl Vinson, an aircraft supercarrier, is also engaging with South Korean navy ships in waters off the Korean Peninsula, according to Seoul’s Defense Ministry. Associated Press writers Hyung-jin Kim in Seoul, Mari Yamaguchi in Tokyo and Frances D’Emilio in Rome contributed to this report.